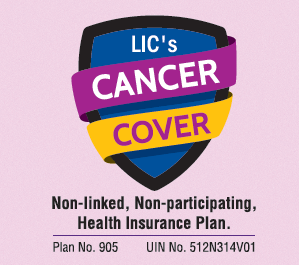 LIC Cancer Care is a disease-specific policy (plan 905) launched by LIC. It is a non-linked, non-participating, health insurance plan. The main objective of this plan is to provide financial protection in case the life assured is diagnosed with any of the specified early or major stage cancer during the policy term. Prior to this LIC has already offered health insurance policy called as LIC Jeevan Arogya. LIC Cancer Care policy can be purchased online and offline. 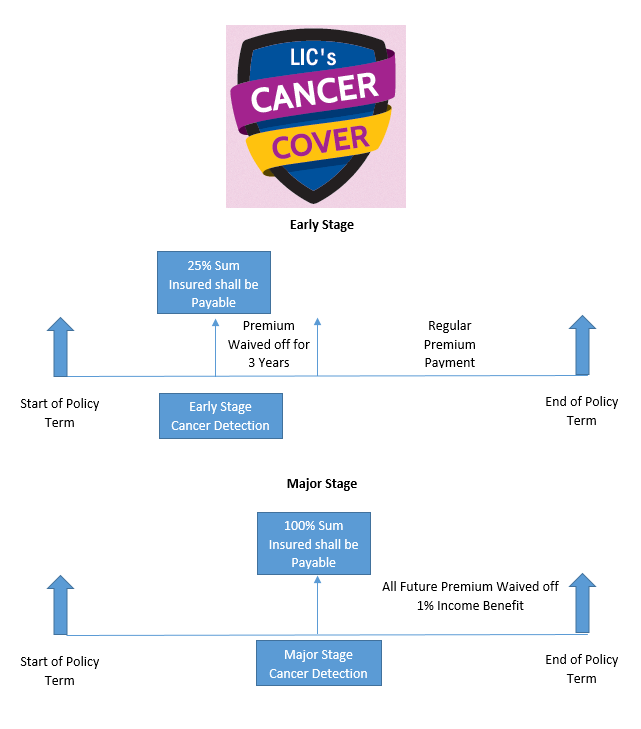 In this post, we will take a look at LIC Cancer Care Policy features and benefits. Premium Paying terms is either half yearly or yearly. No Loan facility will be allowed under this plan. Free Look Period of 30 days is provided. Incase policy holder is not satisfied with terms and condition he/she may return the policy. The LIC Cancer Care plan offers two benefit options wherein you have the flexibility to choose the type of sum assured at the inception. Option -1 Level Sum Assured- The basic Sum insured remain fixed throughout the policy term. Option -2 Increasing Sum Assured – The sum insured increases by 10% of basic sum insured every year for first five years starting from first policy anniversary or till diagnosis of cancer. Read – How Life Insurance Agents are Misselling Insurance Policy? Lump Sum – 25% of applicable sum insured shall be payable as lump sum benefit. Premium Waiver – Premium for next three policy years of balance policy term whichever is lower shall be waived. Lump Sum – 100% of applicable sum insured less any previously paid claims in respect of early stage cancer shall be payable. Income Benefit – In addition to lump sum benefit, income benefit of 1% of applicable sum insured shall be payable on each policy month for the fixed period of next 10 years shall be payable. In case of death of the life assured, while receiving this income benefit, the remaining payout will be paid to the nominee. Premium Waiver – All future premiums shall be waived from the next policy anniversary. No death benefit or survival benefit associated with this policy. Before buying LIC Cancer Care Policy let’s take a look at positive and negative associated with this plan. One can purchase this policy online and offline. As policy is available online premium will be low. It is pure term plan type policy. The only change is it is designed for specific diseases cancer. As it is term plan premium shall be low. In case major stage cancer is detected benefits are much better. As one will get 100% sum insured along with that 1% income benefit shall be paid. This policy comes with 180 Days waiting period means risk cover will start after 180 days. No benefit on death or survival of policy holder as it is diseases specific policy. Tax benefit under 80C is not applicable. However, you can claim benefit under 80D. This policy comes with a lot of exclusion which one needs to understand before buying the policy. Family floater option is not available. This means one has to purchase an individual policy for every family member. Overall it is good policy. However, if you have sufficient health policy it is better to stay away from LIC cancer care policy.